I came across this article by The Undercover Recruiter about 10 traits to look for in a good recruiting agency and I’m proud to say these are the same things I expect from my team here at Alliance Search Solutions. Finding the right recruiting partner means knowing you’ve found the right person to advocate for your company in the competition to attract the best talent. You need someone who knows and understands your company’s needs, but there are many more traits of a strong recruitment agency. Check out this list to see how your agency fairs. If you’ve personally worked with us at Alliance Search Solutions, feel free to send me an email at tnicol@alliancesearchsolutions.com and let me know if you think we match up to this list. Good: Knows the industry and size of your company and will target the right candidate – to make sure they will be the right fit they’ll vet the candidate appropriately. Bad: Hasn’t taken the time to meet with managers or get to know you or the company; they are too focused on getting the next candidate or client to partner with. Good: Understands where your business needs lay and is a true partner with what you are trying to accomplish. Bad: Doesn’t take the time to know what your business goals are and worries more about what they will receive in revenue than finding the right candidate. Good: Takes time to meet with you to go over your needs and seeks feedback after interviews to ensure they are targeting the right pool of candidates. Bad: Puts the same type of candidate in front of you after you have said no and doesn’t understand why you continue to say no plus continuously has excuses on why things are not a success. Good: Takes time to hear what you want and need, doesn’t put pressure on you to make rash decisions but sets up timetables to get adequate feedback. Bad: Asks the same questions and will find short cuts on getting you the right candidate because they are pushing too many candidates to you that do not fit your needs. Good: Can speak about what you need by knowing the industry you are in and can break down a position to find you the right candidate. Bad: Works across all skill sets and doesn’t really understand what they are recruiting on which in return will give you the wrong types of candidates. Good: They will deliver the candidates in the timeframe they committed to and they know what you need as a business. Bad: They will waver in their commitments, they have erratic success with you and they rarely keep you up to date with their progress and results. Good: They will stick to their vetting process and will not skip steps which would lower the bar on the quality of candidate for you. 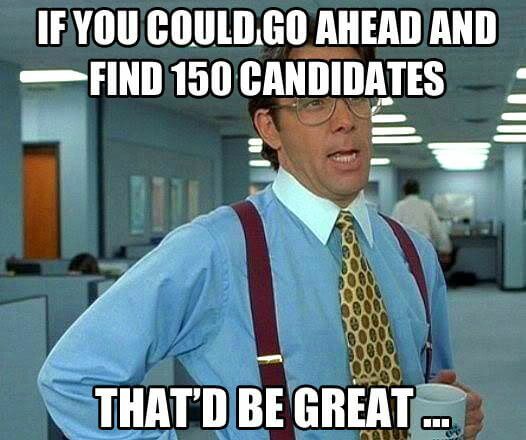 Bad: They don’t meet with their candidates, they do not perform reference checks and they just send you a high volume amount of candidates so you can do the screening instead of them. Good: Always exceed your expectations on the candidates they supply. Bad: They are delivering the same candidates that have applied on their own or they supply candidates that you have already seen through recycling of candidates or through other agencies. Good: The candidate that is supplied has the exact same experience as the resume advertises and they educate the candidate about your company to make sure they are walking into a role they really are excited about. Bad: They will misrepresent candidates by adding experience that is not accurate and they will coach the candidate to say things that are not accurate to their experience. Good: Is in contact with you the right amount of time but not disrespectful and annoying. Bad: Is too aggressive at the point of calling your managers 7 to 9 times a day to try to get more business or feedback.